Keeping up with the annual innovation tradition, GENBAND has yet another great show planned for our customers, prospects, partners, media and analysts at this year’s Mobile World Congress in Barcelona. In addition to an awesome booth design and great location (Booth 2I31) in Hall 2, we have a jam-packed schedule of activities, meeting with our valued customers and partners, while briefing key media and analysts throughout the four-day event. One of the best parts about the show is that we get to highlight our new real-time communications mobility capabilities, NFV innovations and close ecosystem partner collaboration. The mobility innovations that our team is developing to help our customers improve the communications experience are truly amazing. This year we will be featuring our Kandy Platform IoT capabilities. Kandy is our award-winning cloud communications platform that easily adds messaging, voice, video, presence, and collaboration capabilities directly into mobile and web applications. Our team has now enhanced the Kandy platform to deliver the “human element” to IoT connectivity via contextual Real-Time Communications solutions. We will also be showing off our industry-leading Voice Over LTE (VoLTE) media processing and transcoding solutions, which are helping our service provider customers dramatically improve voice quality, while at the same time providing network bandwidth advantages. In fact, our NFV-based VoLTE transcoding solutions are powering some of the largest mobile service providers in the world, helping them evolve their networks to enable a better user experience for their customers. Additionally, we will be highlighting the great work we are collaborating on with our Network Functions Virtualization (NFV) Ecosystem partners, which include the likes of Hewlett Packard Enterprise (HPE) and Wind River. Our joint demonstration with HPE will include the ability to dynamically deploy network services across multiple environments and the ability to instantly respond to network traffic changes and demand, while realizing significant cost savings. We will also be participating in the HPE OpenNFV Partner Showcase in Hall 3 Stand 3E11. Our Wind River demonstration will highlight the integration of our virtualized applications with Wind River’s Titanium Cloud software environment to showcase secure and seamless real-time communications sessions capabilities and improved network visibility. In addition to these featured solutions and demonstrations we will also be showcasing other advanced mobility capabilities including VoLTE Roaming and Interconnect. One of the staples of our presence at the show is the GENBAND Tuesday evening party and this year is no different. What better way to wind down from a day of craziness at the show than a great evening of food, entertainment and music? 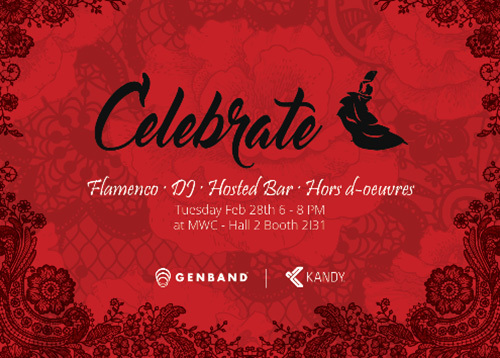 We are celebrating by hosting a cocktail party at our booth (Hall 2 Booth 2I31) Tuesday, February 28th from 6 – 8 pm, featuring flamenco music & dance, live DJ, hosted bar & hors d-oeuvres. Be sure, to stop by and say hello. No doubt, it’s going to be a great week in Barcelona; I hope to see you there. Sign up here if you’d like to meet with the team in Barcelona.